JACK E. BEANSTALK Jr. - young man, 18 – 25 – attractive and articulate. MRS. BETTY BEANSTALK (MRS. B.) - Jack’s mother, 55 - 60. Short, frumpish and mercenary. M.J. STUART - Young female Prosecutor. She is a competent attorney using this case to make a name for herself. CHARLES THOMAS RENYEAN (C. RENYEAN) – Male Defense Attorney, experienced and successful with criminal defense. Mature looking, late 40's – Mid 50’s. NEVILLE C. BOWDIN (JUDGE) - Experienced Judge, competent and fair even though his manner may seem abrupt at times. MARION JANE KITCH (MARION) - Complaining Neighbor – 40’s, divorced, lives alone. She is a bit of a flirt. JOAN O’HARP (HARPY) – Witness. Female, 18 – 20. Used to live with the Giant and has fallen in love with Jack. Joan sings her lines melodically. MR. DOWNFEATHER GOOSE (GOOSE) – Witness. Male, Age Undefined. A goose who used to live with the Giant and lays golden eggs. He honks when tense or overly excited. THE OLD MAN – 60-65. He is a disguised member of the gallery with a past. 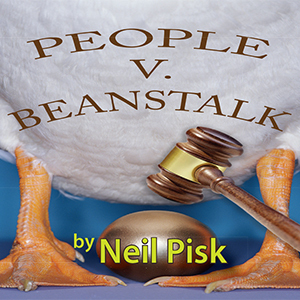 Jack Beanstalk is on trial for the murder of the Giant. This modern approach to the classic fairytale is a clever retelling of the story. And, as with all good courtroom stories, this one has a few twists and turns. The final outcome will be decided by the Jury, pre-selected members of the audience, who render the final verdict! This is an original work by a local playwright. Come be part of theatrical history and have your name forever part of the original cast when published for future productions!